While many of us have never visited a tropical rainforest or other wild habitat of parrots, we do have some knowledge of their home in the wild from information garnered from books, magazines and the media. There are many excellent TV nature shows that are filmed in the natural habitat of parrots. With a little imagination and a lot of common sense, we can easily adapt Mother Nature’s way of doing things to enhance our birds’ lives and keep them safe and healthy. The following questions have been asked by new parrot owners and the answers are based on Mother Nature’s example. Answer: Mother Nature provides the necessary vitamins and minerals for parrots in the form of whole foods. The diet of wild parrots includes a variety of plant foods, including seeds, nuts, fruits, berries, leaf shoots, buds, stems, sprouts, flowers, pollen, nectar and more. 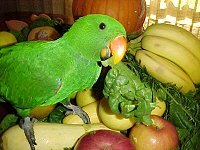 The parrot’s digestive system is designed to extract nutrients from a diet that is high in fiber and low in nutrients, or “nutrient sparse.” Vitamin preparations are exactly the opposite ( low in fiber and “nutrient dense.” Parrots have the digestive tract of an herbivore, and nutrient-dense preparations are over-stimulating to many parrot species. This can cause hyperactive behaviors such as screaming, aggression such as biting, and self-destruction of feathers. At its worst, an extremely enriched parrot diet can cause self-mutilation of skin and flesh. Ignoring nature’s plan in this way can literally place captive parrots in a life-and-death situation. Answer: Although we cannot provide the exact foods that Mother Nature supplies for our birds in their natural habitat, we can simulate the overall diet by offering a large variety of fruits, vegetables, sprouts, greens, nuts, seeds, and protein foods. It can be argued with some degree of accuracy that much of our food is grown in depleted soil and therefore is lacking in the full complement of nutrients that it should contain. Also, finicky eaters are a problem for parrot owners, and no matter how nutritious and varied our food offerings are, they must be eaten before they can provide nutrition. Parrots can develop nutritional deficiencies in spite of being offered the best of diets if they choose to eat only their favorite foods (not always the best choices) instead of the balanced diet that is offered. 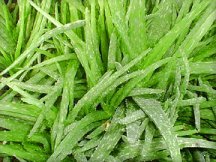 In such cases, supplementing our birds’ diet with concentrates of whole foods such as wheat grass powder is a safer and more natural way to provide nutrition than giving vitamin and mineral supplements created in a laboratory. Other natural food supplements include barley grass powder, carrot powder, beet powder, wheat germ, cranberry juice concentrate, and a favorite of many parrots, fresh fruit and vegetable juices. Giving parrots straight vitamin A can cause problems from overgrown beaks to serious liver damage, but if we offer fresh-squeezed carrot juice, we are giving them a safe and natural beta-carotene cocktail that will be converted by their body into just the right amount of vitamin A. Green supplements like wheat grass or barley grass powder can be sprinkled lightly on a parrot’s soft foods several times a week, but fresh, whole green foods should also be offered daily. Parrots can survive, and indeed look healthy, for a long time on a substandard diet that is deficient in essential nutrients. Mother Nature has provided her winged creatures with reserve stores from which to draw in times of drought and disaster. However, on a long-term basis, deficiencies take their toll on overall health and appearance. We have much to learn about the effects of fresh, living food on avian health. We know that fresh, living foods are the mainstay of many parrot species. The glossy feather sheen, bright and shiny eyes, and noisy exuberance for life that one observes in wild parrot flocks are testaments to the positive effects of a diet of living foods. It is no wonder that so many caged birds lack the look of vibrant health seen in their wild counterparts when we consider how few parrots are fed greens or sprouts on a daily basis. Our birds should receive at least one green food daily (preferably more), and sprouts are a welcome addition to a caged bird’s diet. Wild parrots consume plants in all stages of growth, from dry or newly sprouted seeds to mature plants, and we would do well to emulate Mother Nature’s plan by “greening up” our companion birds’ menu. Answer: When birds consume foods high in water, like greens, they excrete the excess water when they urinate. Watery droppings should not be mistaken for diarrhea. Fresh, moist foods do not cause true diarrhea, but rather a harmless increase in clear, liquid urine output as the bird eliminates the excess water. Loose droppings that are mistaken for diarrhea is an outdated excuse for not feeding the green foods that are natural to the wild parrot’s diet and essential for health. The nutrients most commonly deficient in the parrot diet are those found in abundance in leafy green foods. Greens contain phytochemicals which are substances found in plants that stimulate the immune system and help prevent disease. Fiber is important to the health of parrots and it can be found in generous amounts in green foods. Parrot owners might be surprised to learn that dark leafy greens are far richer in calcium, per calorie, than is cow’s milk. Kale, turnip greens, mustard greens, broccoli, and bok choy are the greens richest in calcium. Darker greens have a higher beta-carotene content than lighter greens, so kale and collards are a good choice of greens for birds. In general, foods of deepest color contain the most nutrition. Answer: Not only are most herbs and spices safe, but many can be used as preventive and curative measures. Consult an herbalist or holistic veterinarian before giving your bird any unfamiliar herb. Here are a few of Mother Nature’s finest offerings to keep our birds happy and healthy. CHAMOMILE flowers are tiny, daisy-like flowers that are especially helpful to parrots that need a calming influence. Chamomile is one of nature’s safest and mildest sedatives, and it can be offered as flowers, fresh or dried, or as herbal tea to calm birds in stressful situations. CINNAMON sticks can be used as a “food toy” for parrots. Ground cinnamon can be used on soft foods as a mild anti-fungal treatment for candida and other types of yeast, and aspergillus. Cinnamon also has a mild anti-bacterial effect against strep and staph bacteria. It can be sprinkled on fresh foods in hot weather to help prevent the growth of pathogens on bird food.